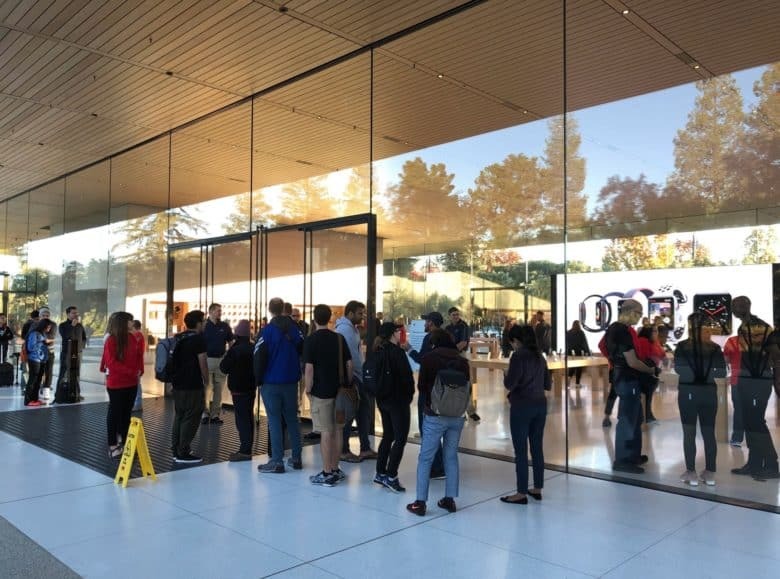 They're not waiting for the iPhone X.
Apple opened the doors to the visitor center at Apple Park to the public this morning. And of course, there was a line to get in. Construction is still being completed on the main campus but you can now get a first-hand view of the campus at the visitors center. The newly opened building looks a lot like a regular Apple store on the inside, except it features some products you can only buy at Apple Park. Apple employees greeted the first visitors with a round of applause and high fives. The only other part of the campus the public has been invited inside so far is the Steve Jobs Theater for the iPhone X unveiling. T-shirts, bags, hats, Apple Watch bands and more can be purchased from the visitor center. You can even order coffee, tea, or snacks from Caffé Macs via an iPad. All of Apple’s current products are also on display. The Apple Park Visitor Center isn’t part of the main spaceship campus building. It’s located across the street but there is a rooftop observation deck so you can try to spy Apple employees leaving the building.